Come on out to the Tavern on the Rail! A unique and special dining establishment on Rt 618 in Fredericks Hall, 5.5 miles east of Mineral in Louisa County, Virginia. The 1837 building, a Nationally Registered Historic Landmark, was restored by owners Melody and Kenny Bowers. 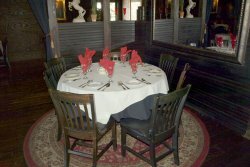 The upstairs offers upscale yet relaxed dining. The downstairs is welcoming and cozy for casual dining or a quick bite. Reservations are recommended for Friday and Saturday nights. Enjoy the beauty of our 170 year old general store that has been restored for your dining experience in a rustic, yet elegant atmosphere. 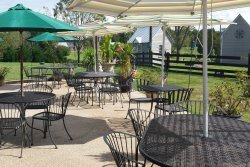 Tavern On The Rail is located only minutes away from Lake Anna, numerous battlefields, and historic landmarks of the War Between The States, and Virginia wineries. White tablecloths and candles adorn each table in the upstairs dining room. Casual attire is quite at home here. Enjoy the eclectic decoration and especially the homecooked entrées. 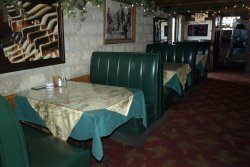 Downstairs offers booth seating in a rustic and cozy old-time tavern atmosphere. Check out our full bar offering coctails, mixed drinks, wines and beer and our original ice block cooler that serves as our wine cellar. Great for enjoying the fresh country air and watching the train go by! Enjoy our patio dining with all the same menu items available indoors. Bright and inviting, country air with a quaint, beautiful environment. Tavern On The Rail can be reached by car in about 45 minutes from Richmond or Charlottesville and about an hour from Fredricksburg. From Charlottesville or Zion’s Crossroads: Take I64 east to the RT208 Louisa – Ferncliff exit and head towards Louisa. Once in Mineral take RT618 toward Bumpass. We are approximately 5 miles down. Tavern Road is on the left, just before the second railroad crossing. From Richmond: we recommend US33 West to RT609 – Buckner Rd. Follow to the end and turn left onto RT618. Go approximately 3.5 miles, cross the railroad tracks and our driveway is on the right. Check for specials at the Tavern!